The informal economy forms a large part of the national economy of many Latin American countries. Unfortunately, informal workers are not offered the same access opportunities to many services. For example, banks may require that their customers must have a fixed address or else have a known source of steady income, even if the applicant is looking only for a savings account without any credit extensions. The bureaucracy-free account is already a success. When it was launched in May, the expectation was that a total of 500,000 accounts would be opened across the whole country by the end of the year. This number was reached at the end of August. "Research has shown for some time that there are around 25 million families that have no access to the financial system, no access to credit," explains Jorge Matoso, president of Caixa Economica Federal, the bank that is behind the scheme to encourage the social inclusion of street dwellers. "This translates into a very large number of people, something like 50 million Brazilians who could have access to the formal banking system, but didn't," he adds. "As well as not having any fixed address, a large number of those who are economically active in Brazil work on an informal basis, and thus have no proof of income." There is no single cause that leads people to end up living in the streets. Among the various reasons are unemployment, alcoholism, drug addiction, mental health problems, abandonment and family disagreements. The great majority of them collect paper, aluminium, iron and other recyclable materials. Getting a bank account seems to represent a way out for rubbish collectors looking for a better life. Apart from the self-respect conferred by having a bank account, there is the practical matter of not knowing how to safely stash away one's hard-earned savings. We will now cite some survey data from the 2002 TGI Brasil study. Within this study, there were 9,310 persons between the ages of 18 and 64 years old who were interviewed during 2002 in nine major cities as well as some smaller cities in southeast Brazil. 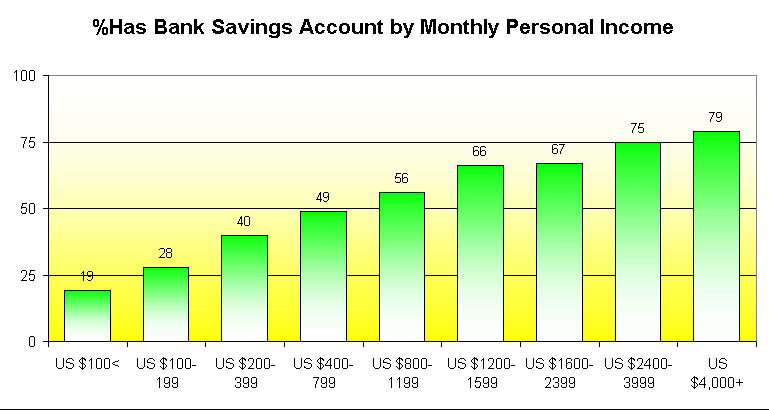 Among these respondents, 44% said that they have bank savings accounts and 56% have an ATM card. 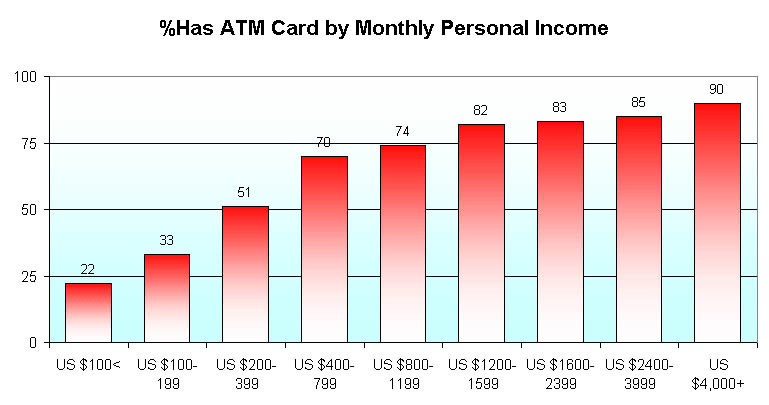 The survey population covers about 47 million people, of which only 21 million have bank saving accounts and 26 million have ATM cards. Since this sample covers only the more affluent portions of the country, the incidences are much lower in the balance of the country. For the banks, this is just about a risk-free proposition. If anything, the risk is on the side of the bank customers (e.g. the freezing of all bank accounts imposed in Argentina during the financial crisis).